Superintendent of Schools Susan Dorsey spoke out on behalf of Mary Holt, registrar at the Mt. Vernon Junior High, saying, "I spoke with Mrs Holt, and am satisfied that I would have acted as she did if I were confronted with the same circumstances." 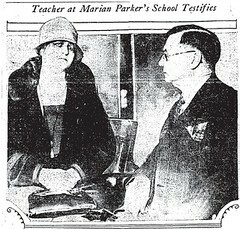 Holt excused Marion Parker from school on Thursday, December 15 when a slender man came to the desk and asked for "P.M. Parker’s youngest daughter," saying that her father had been in an automobile accident. Holt hesitated, knowing that Marion was a twin. However, the man persisted, saying, "I am an employee at the bank where Mr. Parker is chief clerk, and if there is any doubt in your mind, here is the bank’s telephone number. You may call there." Convinced, Holt sent an office assistant to get Marian from class. "Marion was nervous and excited when I told her that her father had been injured. The news completely broke up a little Christmas party the children were having in their room, and Marion had some of the refreshments in her hands when she came into the room. But at once she forgot about everything but her father." Marion was excused from school, and left with the man who would, three days later, end her life. After the kidnapping, Holt said, "Oh, I can think of many things I could have done now. I never would have let Marion go but for the apparent sincerity and disarming manner of the man." Private funeral services for 12-year-old Marion Parker were held today at the Little Church of Flowers at Forest Lawn Cemetery, after which her body was cremated. 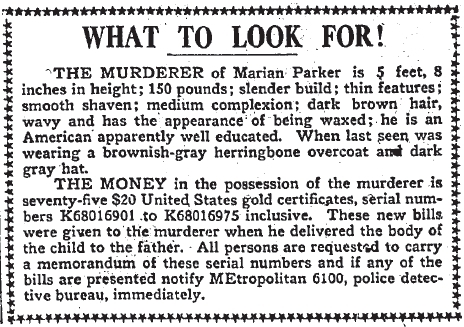 The search for her killer continues, with police and citizens as far away as Denver and Portland on the lookout for the Fox.